Brand brand new non-OEM. 3-In-1 Features: Synchronize, Charge Phone as well as Charge Extra Battery. Synchronize & Charge phone with USB cable. Charge additional battery with AC adapter. USB wire sync & assign phone ONLY. 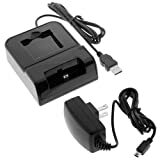 AC adapter assign 2nd battery ONLY. This dock is pretty poorly designed. When plugged into the wall and computer at the same time the dock feeds power back into the computer. So when you turn off your computer there is power being fed into parts like fans. But this is easily remedied by cutting a wire inside the dock. Only thing that changes is that you loose the ability to charge your phone by AC alone. But according to the description of the item you shouldn’t have that ability anyways. So there you have it after a wire snip you can still charge the spare battery and sync and charge your phone. Without the back feed of power into your computer. This charger combo really comes in handy when one wants to charge both the phone and a spare battery at the same time. To me, this is a must, seeing that the battery in the Touch Pro/Fuze does not last a long time if you even if you use it sparingly. There are a couple of things I would have like to have seen, one of which would be an ExtUSB passthrough so I could use my earphones while the phone was being charged. Unfortunately, like many other chargers for the HTC, charger manufacturers chose not to use HTC ExtUSB plugs and instead opted for the standard mini USB which fits, but you lose the extra features. The other thing that I would have liked different on it is there choice of LED status lamps. The blue LED power lamp is rediculously bright at night and I have to cover it with something otherwise it practically lights the whole room. The other LED lamp for the external battery constantly flashes between red and green when no battery is inserted and to me that is annoying. When you put in a battery to be charged, the LED turns red and stays on solid. When charged, it turns green and stays on. The charger combo is functional but I would have liked to have seen additional features that would have made this product more flexible. I have no idea how this product performs as it is not compatible with my Alltel HTC Touch Pro. The plugs are not the same shape (sure there is a more technical way to express this but you get the picture). I re-read the product info and nowhere does it specify that the Alltel version of this phone will not fit the unit. This is the second time I’ve had this problem with the Touch Pro and its various accessories- apparently I bought the wrong version of this phone. Yay. If you have an Alltel or Verizon version of the HTC Touch Pro, this is not a product for you. Don’t waste your time. works great. It allows you to charge your phone, a spare battery and sync to your computer at the same time without having to swap cables. the A/C adapter can be used alone for charging just the phone. This has been a very good purchase. About the only criticism I could offer is that it is a bit difficult to seat the phone on the stub USB connector. Once seated, though, it works great. It is quite convenient to charge the phone and a spare battery at the same time.